Intercity is aimed at virtual pilots who want to be able to simulate real flying as closely as possible. Using sophisticated addon aircraft on flights with an average duration of just 96 minutes, Intercity is the airline for pilots who like to fly and be kept busy! Read on to see what we offer in more detail. Our short distance, high frequency operations favour turboprops and narrowbody jets and we operate only one type for each of our mission requirements to reduce costs. You'll immediately be able to fly any of aircraft. We support quality payware and freeware packages from authors such as PMDG, Majestic (MJC), Aerosoft (AS) Flight Sim Labs (FSL) and Dreamwings (DW). Each type has detailed standard operating procedures (SOPs) outlined and helpful FAQs. Intercity operate over 1200 flights a day on almost 700 routes to every corner of North and West Europe, from bases in the British Isles and Continental Europe. Our flights are normally between 45 minutes and 2 hours in duration, which means you spend more time actively flying the aircraft, rather than watching clouds and monitoring instruments! We offer lots of variety and choosing a flight is easy with our simple Schedules Search feature. You can even pick a specific aircraft and fly its complete duty for the day (in your own time of course!). There area also charters and special events throughout the year. Our schedules are highly realistic and consider: weekly passenger demand between cities, existing provision by air and rail, airport slot and parking availability, local restrictions on operating hours, turnaround duration, optimal frequency and timing to ensure flights are spread throughout the day and account for time differences. 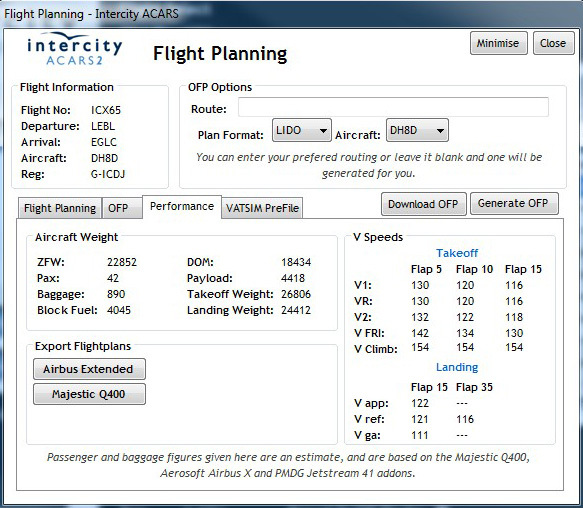 Intercity ACARS2 is our bespoke flight logging program that keeps you in-touch with us. 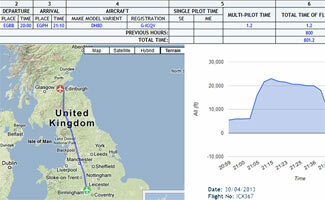 It records and transmits telemetry as you fly for Intercity. These details are used to provide you with a comprehensive logbook, which includes maps and graphs for each of your flights! 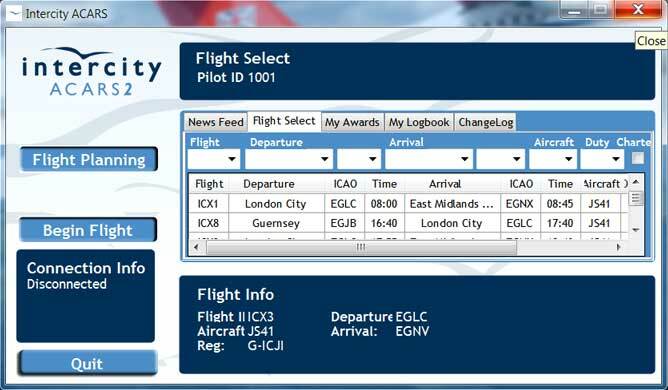 Intercity ACARS2 is quick and simple to use; start it before you fly and input your username, password and choose a flight. Once you've finished flying, add any additional details you want and then press the send button - simple! There are no lengthy forms or complicated third party software. It even updates itself automatically! ACARS2 is a powerful tool but won't impact your framerates and requires no attention during flight, so you can leave it in the background - set it and forget it! 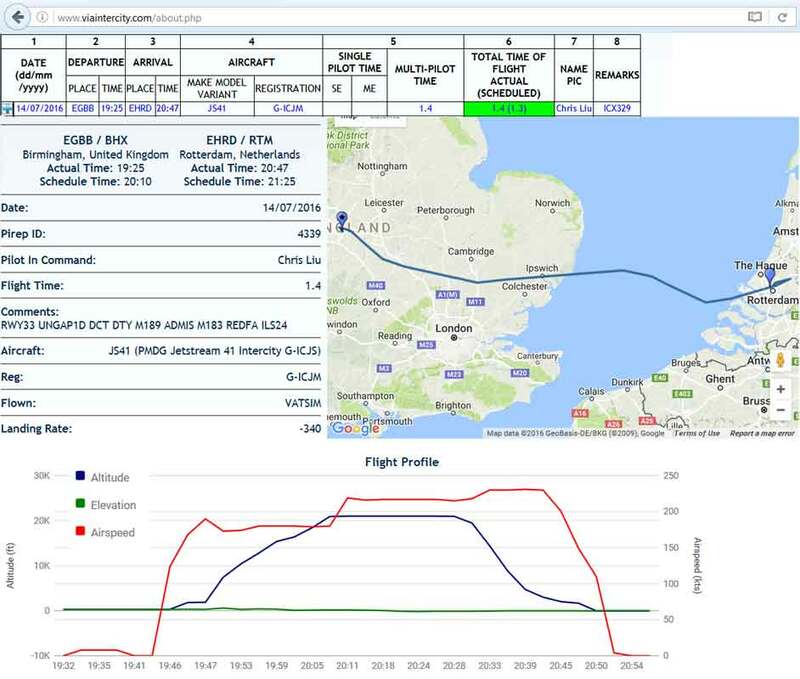 It also provides a live news feed, generates operating flight plans, performs performance calculations, access to your logbook, lets you check progress towards earning awards and checks for cheating, so you can be sure everyone has logged their hours fairly. Pilots are required to fly one flight every 60 days (our shortest flights are under 45 minutes). Pilots who do not will become inactive for a further 90 days before being removed from the airline, however pilots may reapply at anytime. Pilots may apply for a maximum of 180 days leave per year and during this time will not be subject to minimum flight requirements; longer periods of leave will be considered on a case by case basis. To successfully log a flight it must be a route contained within our schedules, use the aircraft type specified and safely land. Unlike many virtual airlines, we'll not reject flights because they landed heavily or arrived late, although we do record this information for you. We encourage our pilots to utilise multiplayer networks that offer Air Traffic Control (ATC) such as VATSIM and IVAO and provide full support for your online flying endeavours, although you are welcome to fly offline if you wish. As an official VATSIM partner airline you can join Intercity in the confidence that we are regularly audited to ensure we meet VATSIM quality standards. 5 (white), 10 (red), 20 (green), 50 (blue), 100 (bronze), 200 (silver) and 500 (gold). 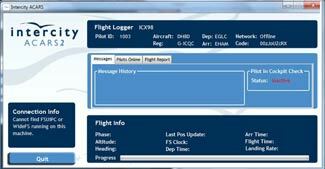 Awards earned are shown at the top of the logbook. In the crew centre there is an awards page showing all the awards earned and awards being worked towards. Newly earned awards are also announced monthly in the forums. Transferred hours do not earn awards. Awards are given for 1st, 2nd and 3rd place in each award category. You can see who's leading this month on the stats page. The final results are announced in the News section at the start of each month.